Tom Hickey, once a promising young ruck at the Suns, has been traded from being one of several viable ruck options at St Kilda to probably getting a regular game at West Coast next year. Hickey was probably shaping as second, third, or fourth choice for St Kilda into the future, given the presence of Billy Longer and the emergence of Rowan Marshall and Lewis Pierce. The Saints deployed Piece and Marshall as a duo in the last three games of 2018, and one or both look destined to take over the ruck mantle at the Saints, with even Longer likely to end up a backup option. So it makes sense for them to shed Hickey and focus on their emerging ruck stocks. Hickey is old enough, reliable enough and average enough that he’s a short term gap-filling prospect for a club, which is exactly what the Eagles need while they contend for another flag. With Lycett heading for the door and Rory Lobb requesting a move to Fremantle, the Eagles needed someone to cover Nic Naitanui in the short term. Naitanui won’t take much (if any) part in 2020, which presents Hickey the chance of slotting in as one of the two rucks in their relatively different (for 2018) structure. In addition, Nathan Vardy has had issues with injuries in the past, and he should be able to fill that gap if he’s hurt. Unlike Lycett, Hickey isn’t much of a goal kicker, which means that Vardy will probably take more stints resting up forward in the short term. 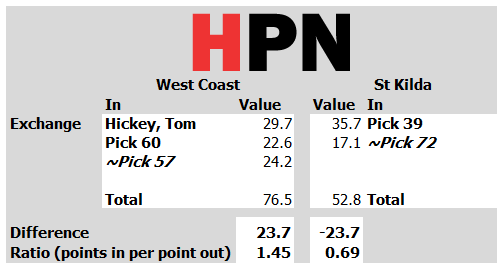 The trade values Hickey at less than his projected output and looks skewed to West Coast. This valuation by the two clubs probably reflects that both clubs don’t exactly see Hickey as option number one in 2019. St Kilda come away with the better pick, and given Hickey was looking at perhaps not getting senior game time at the Saints, this aspect of the trade could easily leave the Saints the winner in the end despite the lopsided appearance of the swap. Verdict: Unfair trade favouring West Coast.